If you see other people doing good things around town, you can also nominate them to receive free fuel at tanksofthanks.com. Share this program and let’s get this good deed initiative spreading across the country. Share with your friends on Facebook and Twitter. Thanks to all those who go the extra few hundred miles in serving the people around you. PETCO Foundation awarded a spay/neuter grant to Cocker Spaniel Resoruces, Inc. for $29.02.63 PETCO Stillwater MN nominated CSR for the award. Thanks to PETCO Foundaiton we will be able to spay or neuter more cats and cocker spaniels than we normally can sterilize. A very special Thank you to PETCO Foundaiton and the PETCO Stillwater Store for this wonderful grant. Presenting the check is Mike Smiley, PETCO Stillwater store manager. Pictured Left to right: Connor Nelander-Tholoe, Mike Smiley, Karen Kuula, and Vicki Bliss. The CSR Angel from Cocker Spaniel Resources, Inc has been awarded Miss July for 2013. Taren Weyer sent a picture of Angel, a 7-year-old red cocker spaniel, to PETCO for their yearly photo calendar contest and Angel won out of all the entries. 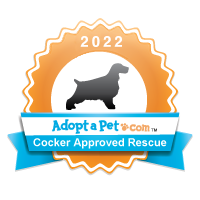 In 2013 CSR was awarded the second place honor in the theanimalrescuesite.com/shelter+Challenge. This awarding entitled CSR to receive 100 Vaccinations from Petfinder. Cee Cee Won the Photo Contest! In March 2012 Cocker Spaniel Resources Inc. was excited to receive an award notification for Cee Cee who won the Doggy Photo Contest! One winner was selected from each Twin City rescue and each of the winners receives a spot in the upcoming book Rescue Dogs of the Twin Cities. We’re so proud of Cee Cee! In March 2013 CSR received 6 dog Thundershirts from a Petfinder and Thundershirt Grant. Myles is pictured wearing one of the shirts.